Here's my third review for the Miss Beauty nail polish range exclusive to Poundworld. Yes that's right Poundworld so you guessed it, it only costs £1. This one is named 'Pastel Blue' however I would describe the shade as lilac. Gorgeous pastel polish, and as per the previous Miss Beauty nail polishes I've tried it applied very well, nicely pigmented, good enough brush and and decent size 12ml bottle. If you're on a budget or just don't want to pay over the top prices for nail polish I highly recommend this brand from the 3 polishes I've tried and I've got more to come. 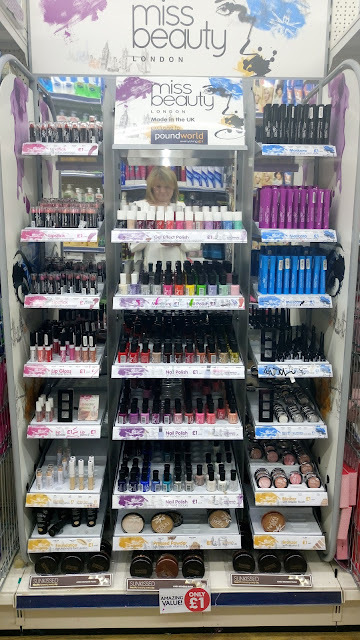 Next time you're in Poundworld check out the Miss Beauty cosmetics stand and be prepared to drool over the generous nail polish range. 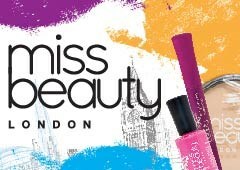 Miss Beauty Nail Polish is manufactured in the UK, are 5-Free, Vegan friendly and not tested on animals - yay! More Ooooooo - I want them all!!! Miss Beauty Nail Polish is £1 (obviously!) for a 12ml bottle, available in lots of different colours and finishes. Poundworld is on Facebook, Instagram, Twitter, Pinterest, Google+ and they have their own Blog. This product was sent to my for my honest review, and I suggest you go grab yourself some Miss Beauty nail polishes at a £1 a pop you can't go wrong! Click on the Banner below to be taken to Miss Beauty & Poundworld! MoYou Nails Spectacular Giveaway - 10 PRIZES!! !